Almost three million people are employed in retailing. Three quarters of these are women (source: German Retailers Association). If they were all to be off work sick, the shops would have to remain closed. To stop this happening, here are a few tips on how to stay permanently fit – despite having to cater for the needs of diverse clients, irregular working hours, exhausting work, stressed skin and standing for hours on end. Inviting decorations in the shop windows, attractively arranged articles, lively bustle, soft music, exotic fragrances and a nice chat with the friendly sales assistant. Shopping can be such a lovely experience, at least, it should be for the customer who expects polite and competent advice as soon as he enters the shop. A vital condition for this: healthy sales assistants, who feel at ease and are satisfied - something not to be taken for granted in view of the high workload and the physical exertion demanded by work in retailing. Read here what you yourself can do to keep enjoying retailing work. The salesroom is filling up, the queue at the cash desk is growing longer, the new articles are piling up in the stockroom and there's still no sign of your colleague. Now it's important to stay cool – for your health's sake. There are many methods for coping with stress. It often helps to just take deep breaths, to think positively, to draw up a timetable, to set priorities and to let off steam with sports in your leisure time. Heavy objects often have to be lifted and heaved around when fitting out or decorating the salesroom or when dealing with new deliveries. This not only affect the muscles, but also puts a lot of strain on the spinal column and intervertebral discs. So: hold heavy objects as close to your body as possible when carrying them. Always keep your back straight and use your legs to lift. What's more: never carry anything you could pull or push. Use transport aids and ask colleagues to help. Train your back muscles, in order to strengthen the muscles and ligaments of the spinal column and relieve pressure on the intervertebral discs. It is particularly important in retailing to adapt the working hours of the sales staff to the customer volume. This means irregular working hours for the employees. Work at the weekends and in the evenings is the rule. In order to prevent ill health, statutory health insurers recommend regular training with simple fitness equipment at home as well as jogging or power walking. A low-fat diet rich in protein and carbohydrates also helps keep you fit. Selling unpacked foods, frozen goods or flowers can be very unkind to the skin of the hands. The frequent use of cleaning agents also stresses the skin. To avoid irritation, eczema and allergic reactions, you should wear protective gloves and care for your hands with a rich moisturising cream. Many companies have their own skin protection plans. According to the Rationalisierungs- und Innovationszentrum der Deutschen Wirtschaft e.V. (RKW) [German Trade and Industry Centre for Rationalisation and Innovation], a salesperson spends 70 to 80% of his or her working day standing. This is too much when you think that the human body actually evolved to perform regular physical exercise. The result: one-sided use of joints, ligaments and tendons and the body has to make an effort to keep the blood flowing. Large muscle groups are constantly under tension and receive little blood. 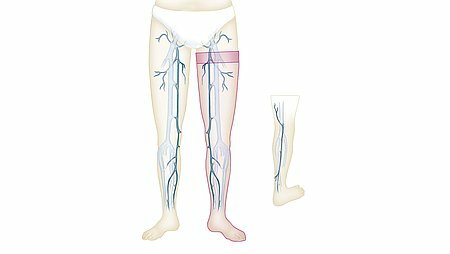 The calf muscle pump that promotes the return of venous blood no longer works efficiently. The veins widen and the venous valves no longer close properly. This results in tired, heavy legs and may lead to the development of varicose veins. This is why medical compression garments provide the ideal support during working hours. These are medical devices that can be prescribed by a doctor. They are fitted individually by surgical appliance retailers. The medical compression garments from medi look like normal socks and stockings and are available in sheer or opaque models as well as in many standard and trend colours. To keep your veins healthy, you should also take part in sports and organise your working day to make it as varied as possible. Filling shelves and pricing goods, cleaning and office work offer an effective alternative to standing. And last but not least: invest in comfortable footwear. Watch out for the fit, width adjustment, freedom for the toes, low heels, active breathing upper material and a flexible, non-slip sole.